Geico angler Teddy Carr had trouble with wind at Onieda Lake. SYRACUSE, New York -- Higher winds at Oneida Lake on the second day of the Bass Pro Shops Bassmaster Northern Open No. 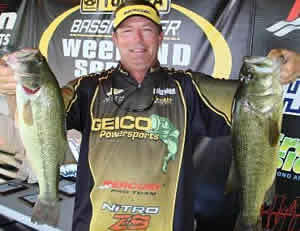 3 hampered GEICO angler Teddy Carr in his pursuit of a top finish in the final Northern Open of the season. Carr hauled in 12 pounds, one ounces on Thursday to keep him within striking distance in a competitive, tightly bunched field. But the wind picked up, and Carr brought in three fish Friday for a two-day total of 19 pounds that was good enough for 84th place. "The wind picked up about 20 mph, and that's what killed my spot," Carr said. "I was competitive Thursday. I weighed in the limit for 12 pounds, and that kept me in the hunt to finish inside the top 30, top 40." Carr began the tournament by fishing three spots on the East end of Onieda Lake. "I was running two different techniques," Carr said. "When the wind would pick up a little bit, I'd throw a spinnerbait. I was catching them on a Booyah Vibra-FLX. When the wind would lay down, I'd throw top-water, and it worked. It was a great one-two punch." He pulled four smallmouth bass out of his first spot, then moved on two catch his limit at the two other spots. His second spot came alive with fish late in the day. "Man, there was about two acres of schooling smallmouth," Carr said. "I upgraded there twice. If I had another 20, 30 minutes there, man, it'd have been a whole different outlook." Carr figured that would be a great starting point for Friday, but the wind changed that plan. "I got there, and the wind was just pounding into that place," Carr said. I got one, and then I went about an hour and a half without a bite. I figured I'd go check the other two spots, and I fished each one of them about an hour � nothing there." He decided to go back to the first location and "grind it out" for the rest of the day. Came back to first spot, grinded it out there the rest of the day. "The wind pummeling in there kind of messed up the bite," Carr said. "Southeast winds on that lake knock the bite down quite a bit." Carr fishes next weekend in the Bassmaster Weekend Series regional tournament on Lake Erie off Buffalo, N.Y. on Sept. 30-Oct. 1.